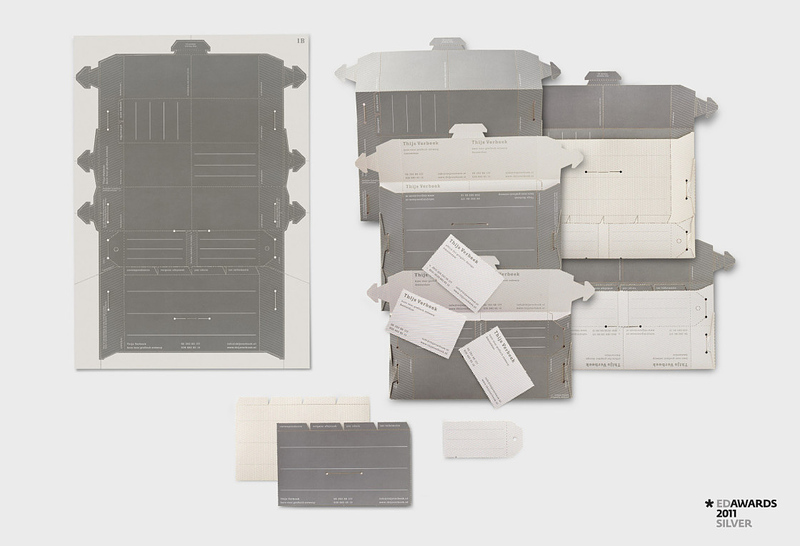 The essence of the identity consists of two A3-size sheets: a paper and a cardboard one, perforated and printed. From these two sheets all of the stationery can be made. The envelope from the cardboard sheet can be clicked together. For the paper envelope adhesive layers have been applied. The cardboard and paper envelopes can get an additional printing for a special occasion. The cardboard envelope can be folded with the business card facing out, or more neutrally: with the grey side facing out. In short, a lot of possibilities, but you use only what you need. When the with compliments card is removed from the sheet a DL envelope can be folded instead of a C5 envelope. For the envelope adhesive layers have been applied.